This article is about the geometrical figure. For other uses of the term square, please see square (disambiguation). A square is a regular polygon of four sides. The four sides are of equal length, and the four angles are equal. All four angles are 90 degrees. A square is a special case of a rhombus and of a rectangle; it is a rhombus with all four angles equal, and a rectangle with all four sides of equal length. 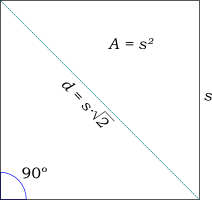 As with all quadrilaterals, the sum of the interior angles of a square is 360 degrees; since the four angles are equal, each interior angle is 90 degrees. The perimeter of a square is equal to 4 times the length of one side. The area of a square is equal to the length of the side multiplied by itself. The diagonal of a square is times the length of one side, as can be easily shown from the Pythagorean theorem. A square is one of three regular polygons which can tile a plane with no voids, along with equilateral (regular) triangles and regular hexagons. In a tiling with squares, four squares meet at corner points. This page was last modified 21:35, 22 January 2010.